If you’re thinking about giving one or more rooms in your home a decorative update, custom cabinetry probably plays a role in your design plans. Custom cabinetry can be added to any room in your home and well-designed custom cabinetry can transform the look and functionality of any space it occupies. With so many custom cabinetry ideas to consider for the entire home, let’s explore your options. Organized Interiors has lots of stylish and practical custom cabinetry ideas that can enhance any bedroom. Our Custom Cabinetry Collection is perfect for dressing rooms (also known as large walk-in closets). We can create a luxurious environment highlighted by rich wood finishes, convenient closet accessories, and an abundance of storage space. Reinvent your bathroom décor with our beautiful custom bathroom cabinetry. Organized Interiors can create a bathroom that matches your vision, whether you’re seeking an aesthetic that’s modern, contemporary, or vintage. The designs of our vanities, makeup tables, and other bathroom cabinetry offer a wealth of custom options. The kitchen is one of your home’s most important rooms and we can help you get the most out of its functionality and looks with our custom kitchen cabinetry. We can ensure your kitchen is making the best use of its storage space and add stylish cabinetry, pantries, an island, and other ideas that will complement your home’s décor. 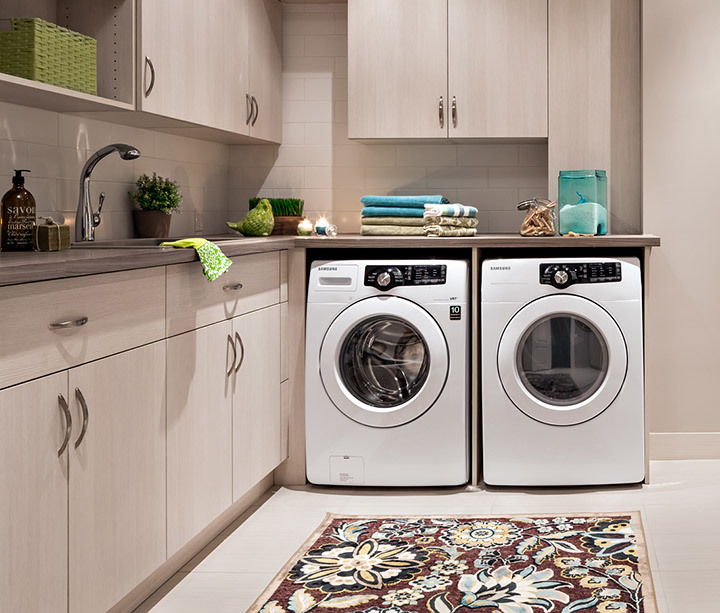 Brighten the look of your laundry room and mudroom with our custom cabinetry solutions. Add easy-to-access upper and lower cabinetry, pullouts, drawers, and countertops to enhance the usefulness and storage capabilities of this task-oriented workspace. Add additional accessories like a hanging rods and built-in ironing boards and laundry hampers to maximize this space’s potential. A custom entertainment unit isn’t just a piece of furniture where your TV is located. It becomes the focal point of any family room or living room, especially when you add any of the design features we offer, such as an electric fireplace, cabinets with adjustable shelves, interior lighting, and many more options. The family room (or just about anywhere else in your home) can also include custom bar cabinetry to store, display, and enjoy your spirits, glassware, and liquor accessories. Organized Interiors can design bar cabinetry of all sizes and styles which will add a classy, chic touch to your home. Our custom wine cabinetry can add a dedicated wine storage room that can double as an entertainment space, a traditional wine cellar, or a smaller reach-in closet wine storage space to your home. 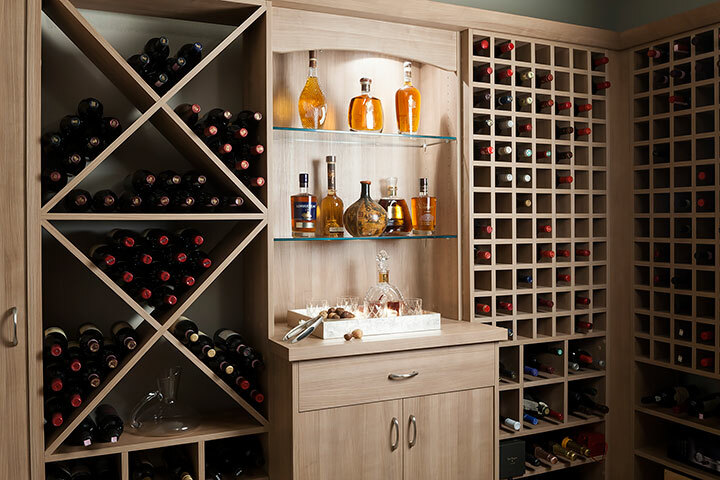 Store your wine collection properly with our sophisticated custom wine cabinetry solutions. Boost your productivity when working from home by having us create a modern home office space. Our custom home office designs with built-in cabinets are comfortable, highly functional, and aesthetically appealing, which creates a working environment conducive to good productivity. Buying cabinetry for your home from a big box retailer might cost less, but there’s a reason for that. Big box furniture doesn’t offer the same quality of materials or craftsmanship as custom-made furniture. That leads to structural and functionality issues, which inevitably result in a short lifespan. Custom cabinetry also lets you choose wood finishes, decorative hardware, and unique sizes to fit your space. With off-the-shelf furniture, you’re limited to far fewer design and size options. And big box furniture can be notoriously difficult and time-consuming to assemble yourself, or may require extra fees to have installed professionally. A custom cabinetry solution is worth the investment, especially when it’s from a full-service company like Organized Interiors. We’re hands-on with all aspects of your custom cabinetry project and don’t outsource any of the work involved. 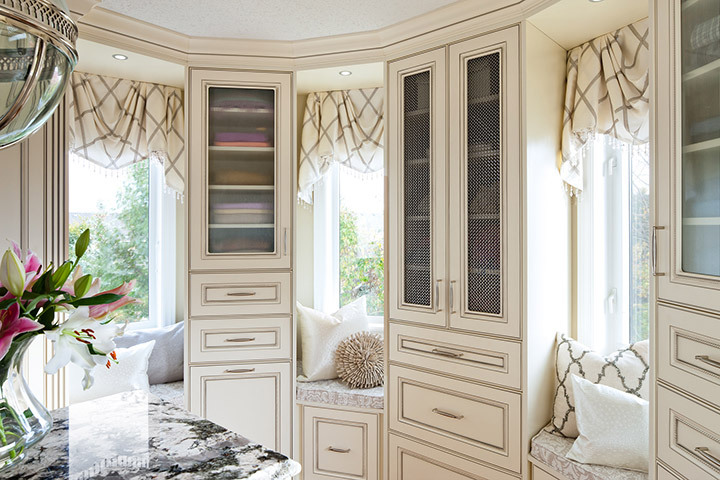 Organized Interiors has custom cabinetry ideas and solutions that can be added to any room in your home. Our stylish custom cabinetry will enhance the looks and functionality of your home and improve your comfort level. Schedule a complimentary in-home design consultation to learn more.